The Patrons of Husbandry, or the Grange, was founded in 1867 to advance methods of agriculture, as well as to promote the social and economic needs of farmers in the United States. The financial crisis of 1873, along with falling crop prices, increases in railroad fees to ship crops, and Congress’s reduction of paper money in favor of gold and silver devastated farmers’ livelihoods and caused a surge in Grange membership in the mid-1870s. Both at the state and national level, Grangers gave their support to reform minded groups such as the Greenback Party, the Populist Party, and, eventually, the Progressives. 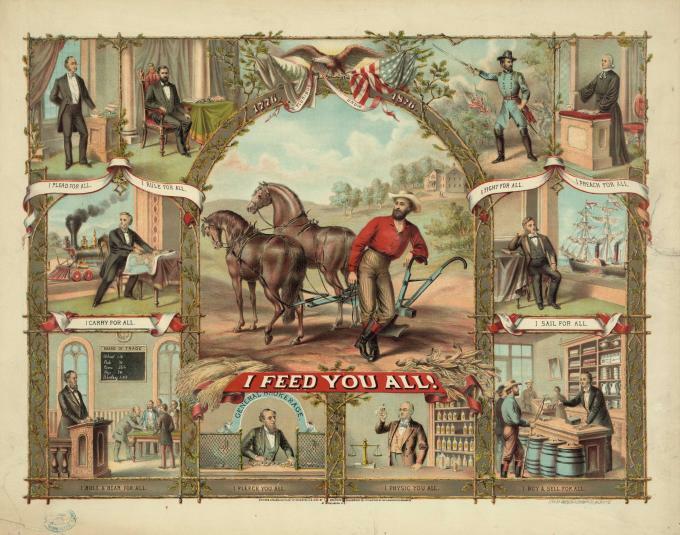 This lithograph, published in 1875, is a modification of the Grange motto, "I pay for all." It asserts that the farmer is the central character upon which all society relies, with the central image of the lithograph being a farmer behind his plow, captioned, "I feed you all!" This vignette appears within a framework of twigs and oak branches, with stalks of corn and sheaves of wheat in the corners. Surrounding the central farmer vignette is a series of other scenes of professionals, laborers, and military and government agents. Clockwise from the upper left corner appear: a lawyer ("I Plead for All"); a seated President Ulysses S. Grant ("I Rule for All"); an officer leading a charge ("I Fight for All"); a clergyman at his pulpit ("I Preach for All"); a ship owner watching his vessel through a window ("I Sail for All"); a shopkeeper in a general store ("I Buy & Sell for All"); a doctor with a scale and drugs ("I Physic You All"); a banker at his window ("I Fleece You All"); a trader ("I Bull & Bear for All"); and a railroad owner watching his locomotive ("I Carry for All"). Read the document introduction, examine the image, and apply your knowledge of American history as well as evidence from the document in order to answer the questions that follow. Explain the reasons the artist featured a farmer under a banner with the dates 1776 and 1876. Which of the images surrounding the farmer have the respect of the artist? Which occupations are being criticized? Explain your selection(s). Describe conditions in the country in the 1870s that led to the formation of organizations such as the Grange.